Competitive situations in career are complicated by interruptions and delays. Juggling finances can also be rather interesting, especially expenditures relating to home, family or moving. Patience has never been so valuable! Stress at work can take its toll on your body, wherever your weak points exist. Strive to become more physically flexible, and treat yourself to a massage at least once this month. Sharing a meeting of the minds strengthens your intimate relationship, and if you’re looking for a new love you may meet someone rather fascinating. But you may feel reluctant to give up much of your time to frivolous pursuits. 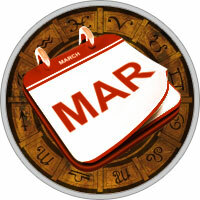 After March 22 you’re more at ease about opening your feelings, although you may have a change of heart. During the Moon on March 31, it’s the soul-level contact that means most to you. Exciting plans take root during important meetings or as a result of significant communication from March 2 to 9, and even though Mercury retrogrades from March 10 to 31, you can still make progress. Review budgetary matters during the Moon on March 2, and look for better ways to use your resources after the Moon on March 17. Avoid unsecured investments from March 17 to 23. Take advantage of these cycles as a good time to get back in touch with those who can help you jump-start an important project. A new twist on old ideas can be motivating.